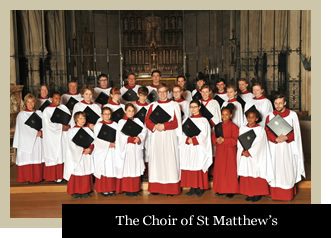 Continuing a tradition of musical excellence that stretches back to the consecration of the Church, the present Choir of St Matthew’s consists of boy and girl Choristers aged between eight and eighteen who are supported by a dedicated team of mixed male and female adult singers on the back row of the choir stalls. The large repertoire of the choir enables it to enhance the worship at St Matthew’s on a weekly basis and perform music to an exceptionally high standard to the Glory of God. St Matthew’s and enjoying social events together. The Choir undertakes a week-long tour during August each year, to St Davids (2012), Portsmouth (2013) Carlisle (2014), Exeter (2015) and in 2016 to Chester. The entire music department is overseen by a Director of Music, Parish Organist and Organ Scholar.